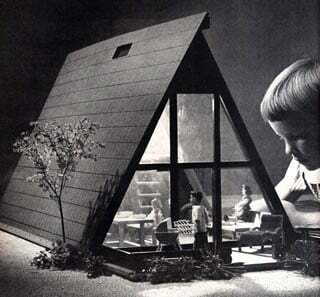 Even the kids got into the act: A-frame doll house (1961 Sunset ad). 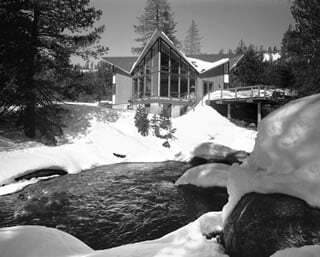 Architect George Rockrise's Squaw Valley family home featured lively intersecting diagonal rooflines that created prow-shaped windows on each corner. Looking out at the Rockrise home's front, 1959. “The really neat thing about the house is all the little nooks and crannies that George put in there,” says Tom Kelly, a manager at Squaw Valley Ski Resort, who bought the house from Rockrise and has lived there since 1976. “For example, we have an ironing closet and lots of little closets where you can store stuff. “And I really like the roof, which is what I call a double-handkerchief. If you took two handkerchiefs and folded them to where the points touch.” Sound familiar? Kelly and his family have kept the house intact, down to the light shades Christina Rockrise made by punching holes in juice cans on one of her family’s summer vacations in the ‘60s. “I remember making everybody drink a great deal of grapefruit juice that summer so I could make these shades to fit over the fixtures,” Christina says. “It really was like a tent. A big, wooden tent,” says Peter Rockrise, the architect’s son and Christina’s brother. Even the most buttoned-down of us need to get loose on vacation, as Christina Rockrise recalled from later trips with her family. After George divorced his second wife—the mother of Christina and Peter’s half-sister Celia—the Rockrises rented out the main house while staying in the basement apartment on ski trips. “The upstairs was rented to a young group of FBI agents, and it was a ski cabin for them in the winter,” Christina recalls. “We were always included when they had parties and that kind of thing. 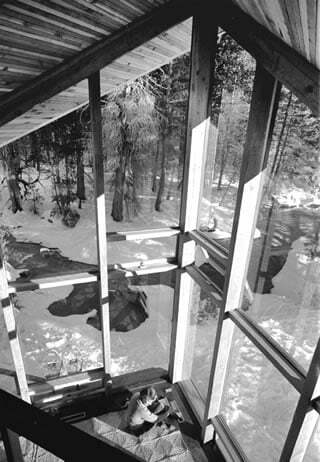 In 1957, the same year Sunset showcased the Perlman house, the Douglas Fir Plywood Association made a deal with another designer to begin marketing simple A-frame plans en masse. The A-frame shape, first introduced just a few years before, was now capturing the eye of both mass-market consumers and tastemakers. When the Tacoma-based association learned that local pediatrician David Hellyer was preparing to build a plywood-shingled A-frame he had designed, it offered him all the plywood he needed for the build in exchange for unlimited use of his plans, Chad Randl writes.